Ball® Mini Mason Jars With Lid, 4 oz. A hot trend in crafting! These Ball® 4 oz. 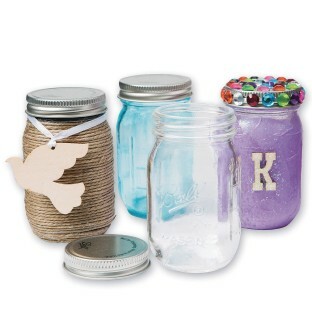 Mini Clear Glass Storage Jars feature a one-piece, screw-on metal lid, are BPA-free and entirely made in the USA. One of the hottest trend surfaces in crafting now comes in a multi-use mini size! Perfect for crafts, storage, decorative use, and art projects. There's an endless number of things you can do with these Mini Mason jars! NOTE: Not for home canning use. Pack of 4.